In his polemic Art and Race [Kunst und Rasse], Paul Schultze-Naumburg (1869-1949) argued that modernist art was the result of the degeneration and corruption of the “northern” races. As evidence, he published works of modern art alongside pictures of people with physical deformities, suggesting that modernism itself was the result of sickness and disease. 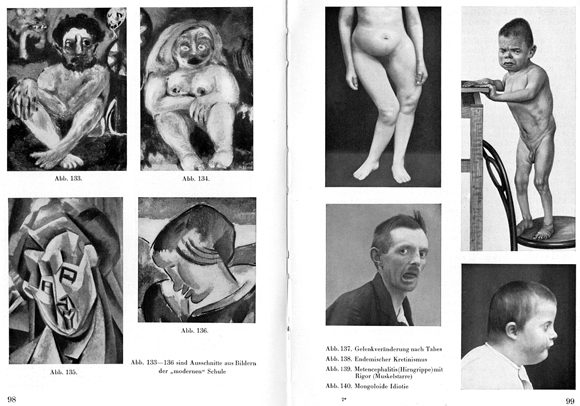 The book was later used as the basis for the exhibition catalog for the infamous “Degenerate Art” exhibition in Munich in 1937, which featured the confiscated works of banned artists. Paul Schultze-Naumburg, Kunst und Rasse. Munich: J. F. Lehmanns Verlag, 1928, pp. 98-99.